Before I was an elementary school ALT, I never had any experiences teaching, let alone teaching English, let alone teaching little kids, and let alone teaching in Japan. Very often I was not sure if my lessons were fun or entertaining, and I would go back to my desk afterwards, thinking how the lesson wasn't capturing the students because of my lack of understanding of Japanese students plus the language barrier. So I thought really long and hard on how to appeal to the Japanese students, first to show them that we can connect despite the language barrier, and then it hit me.... Pokemon! Well, one part of it was to appeal to students, but another part of just simply that I wanted to incorporate things I like into my lessons. As a fan of video games, I saw the perfect opportunity when the lesson for animals arrived. Rather than using the same boring flashcards at school, why not make them more memorable for the students. 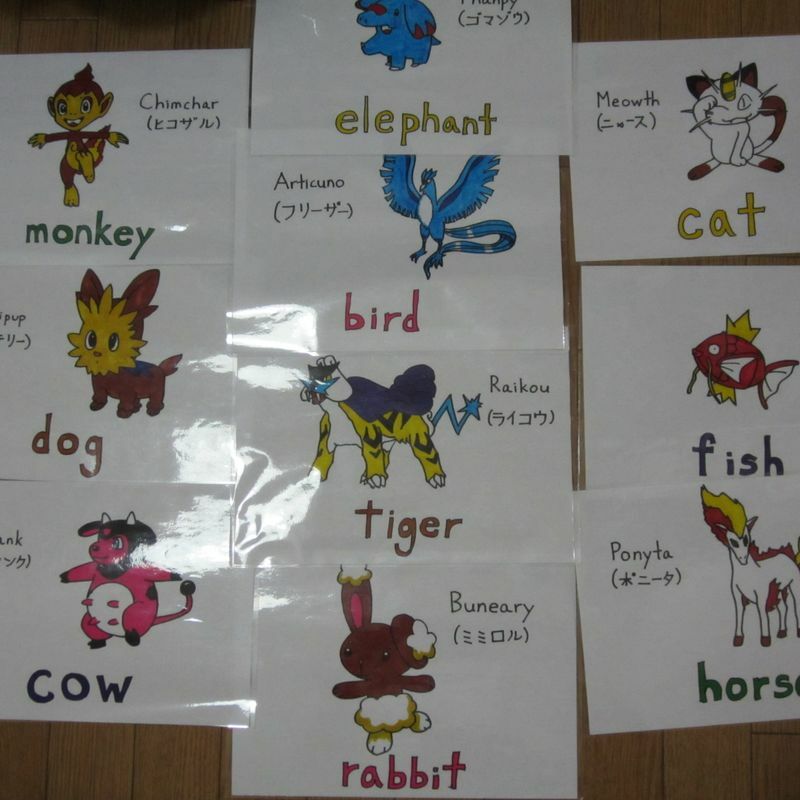 I went online to find reference photos for a collection of the Pokemon related to the animals I was going to teach them. Then, I took a bunch of A4 white paper and started drawing and colouring them. I also took this opportunity to inform students of the name differences between the Japanese and English names. Teachers walked by my desk and saw me drawing. They commented on how thoughtful I was that I evolved the lessons (see what I did there?) to make it more memorable and interesting for the students. The lesson was a blast. Students loved it and ran up to me after class to see the drawings. Some teachers would point out overtly that each card was hand-drawn. I was so proud that I had them displayed on my desk for the next couple months for the students who would come visit the staff room. So why didn't I simply print pictures out? Well, at that time I hadn't figured out the computer and printer system in the school yet. If I did, I wouldn't have earned all the respect as I did. The hearts of the students and other teachers, gotta catch them all!